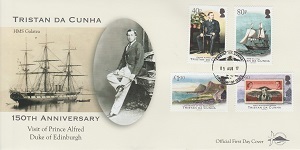 Stamps celebrating the 150th Anniversary of the visit to Tristan da Cunha in 1867 by Queen Victoria's second son Prince Alfred, who was the Duke of Edinburgh after whom the settlement was renamed. 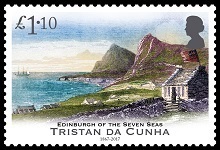 At 7 o'clock on a misty August morning 150 years ago a boat containing eight men set forth from Tristan da Cunha. Its aim was to make contact with a newly arrived Royal Navy steam-frigate, and the flimsy craft was laden with fresh produce, a gesture always appealing to passing ships. At the helm of the little boat was Dutch-born Peter Green, the oldest man on Tristan and the island's spokesman in any bartering negotiations. Waiting to meet him on the frigate, HMS Galatea, was its recently-appointed commander - Queen Victoria's second son, Prince Alfred, Duke of Edinburgh. The date was 5 August 1867 and the events which followed turned the next few hours into one of the most illustrious days in Tristan's history. 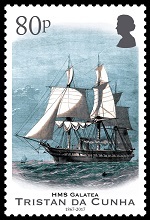 The prince was only 22 and captain of a ship of 3200 tons, with twenty-six guns and a complement of 515 officers and men. It had just called at Rio de Janeiro, and eleven days after leaving Brazil those aboard sighted the summit of the great peak of Tristan, watching in awe as the setting sun 'changed the snow [on it] to a bright pink colour'. Regrettably the prince doesn't sound a particularly engaging individual. Shy by nature and traumatised by the early death of his father, Prince Albert, he was reportedly ill at ease with strangers, though there is no evidence that this was apparent on the day of his visit. Indeed, Alfred's first thought was to enquire what the islanders most needed. Upon hearing the reply he gave instructions for a substantial stock of supplies to be pulled together: fabric for clothing, groceries, tobacco and rum - a consignment worth about £110 (possibly £25,000 in today's terms). With that business concluded, the prince together with a party of officers set off in two naval cutters to cross the turbulent mile or so of ocean to a suitable landing place. Green acted as their pilot. With rollers breaking heavily most of the men struggled ashore on foot, though Green actually carried the prince onto the beach, an experience he never forgot. Once on firm ground the party began its tour of the little nameless settlement, a cluster of some eleven stone cottages, meeting all fifty-three inhabitants in succession. Amongst the prince's party was the artist Oswald Brierly who climbed up the slope above the plain to sketch the scene from Peter Green's house, alongside which there fluttered an exceedingly ragged old flag. Another member of the group was the ship's chaplain Rev. John Milner, who christened sixteen children and offered without success to conduct marriage ceremonies for any of the adults who wished for one. Soon it was time for lunch and a spread of mutton, potatoes, eggs and bread was laid on for all.vBy then 2 o'clock was approaching and the weather looked increasingly threatening. In haste the prince and his entourage made it back to the frigate accompanied by Green and his companions. During their final conversation, and probably at Milner's prompting, Green asked the duke's permission to call 'their little village' Edinburgh. This was agreed, and so it has been known ever since. How did Tristan benefit from this auspicious visit a century and a half ago? In many respects the gain was incalculable. To any of Britain's colonies having a royal in its midst was patent evidence that the throne held it in high regard; it made real that 'vital bond' mentioned by The Times in an editorial in 1867, a linking of support on the one hand and loyalty on the other. 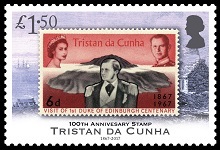 The prince's presence on Tristan da Cunha demonstrated for all the world the British government's commitment to take responsibility for protecting its inhabitants' interests, while the media coverage of the visit significantly raised the island's profile in the eyes of an influential readership right across the settled Empire. Following Prince Alfred's call ninety years were to pass before the people of Tristan had a chance to welcome a second royal visitor, Prince Philip in 1957. It is surely the hope of many that it won't be much longer before a modern-day Galatea brings a third royal personage to charm the islanders with warmth, encouragement and goodwill. Text by Neil Robson, a member of the Tristan Association and a keen local historian based in south-west London where he is the editor of the Wandsworth Historian. 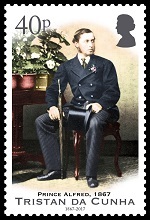 Articles by him have appeared in a number of journals.